Abstract: The Intel Core i5 750 processor is a mainstream quad-core CPU that promises enthusiast-level performance for the masses. The Core i5 750 is part of Intel's most recent generation of socket 1156 processors which include not only the Intel Core i5 700-series but also several Intel Core i7 800-series chips, codenamed "Lynnfield". The Intel Core i5 750 processor is a mainstream quad-core CPU that promises enthusiast-level performance for the masses. 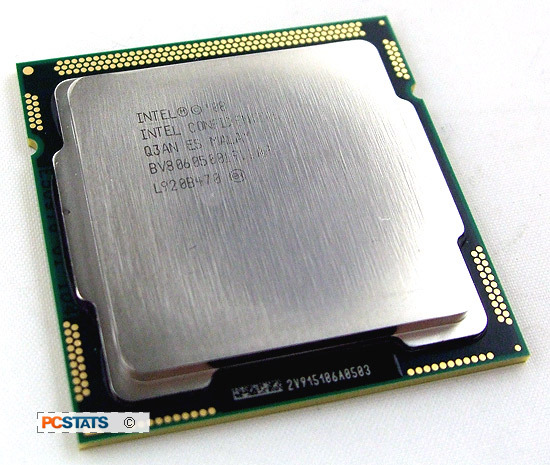 The Core i5 750 is part of Intel's most recent generation of socket 1156 processors which include not only the Intel Core i5 700-series but also several Intel Core i7 800-series chips, code named "Lynnfield". These processors are the affordable, mainstream variant on Intel's "Nehalem" microarchitecture, a codename that should be familiar to PC enthusiasts by now: it's the same highly parallel, low-latency architecture that powers Intel's Core i7 920, 950, and 975 Extreme Edition processors. 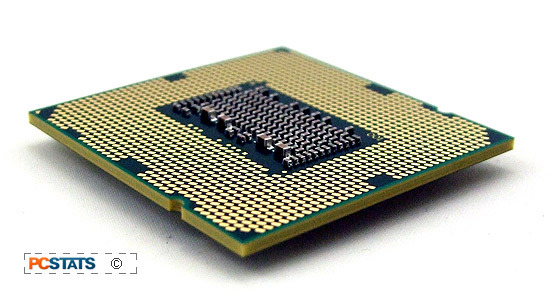 Intel's Core i5 750 processor is actually one of three processors initially launched by Intel. It's joined by the Core i7 860 and Core i7 870 processors. These are the first three processors for Intel's socket 1156, and consequently the first processors that can use Intel's P55 Express chipset. There is a flurry of motherboards using this new chipset, and PCSTATS has done a few reviews of motherboards based on the Intel P55 Express chipset, which are recommended reading if you want the big picture on "Lynnfield". Although it's the entry model for this new socket format, the Core i5 750 still packs quite a punch. It's a quad-core (4 core / 4 thread) processor that runs at a native 2.66GHz with 256KB of L2 cache per core and a large 8MB shared cache. Unlike its Intel Core i7 brothers, the Core i5 750 doesn't have HyperThreading, a multi-threading technique that allows each core to execute two threads at once. This will hold it back in certain massively parallel benchmarks and applications, like Cinebench. To compensate for the lack of Hyperthreading, the Core i5 750 features something called Turbo Boost, an automatic overclocking mode that can turn up the frequency of the Core i5 750's individual cores, based on current CPU load, heat and power levels. If only one or two cores are under load, Turbo Boost may ramp the speed of the Core i5 750 all the way up to 3.2GHz if needed. PCSTATS will be taking a closer look at Turbo Boost and manual overclocking for the Intel Core i5 750 later on in this processor review. Like the socket 1366 Core i7 900-series of processors, Intel's socket 1156 Core i7 800-series and Core i5 700-series processors have an on-die memory controller. While the socket 1366 processors use triple-channel DDR3 memory, the socket 1156 processors use dual-channel DDR3 memory kits, which are widely available and roughly the same price as DDR2 memory. Memory speeds up to DDR3-1333MHz are supported. In addition to the integrated memory controller, the die of the Core i5 750 also contains a PCI Express 2.0 controller with 16 lanes of bandwidth. Having integrated PCI Express connectivity directly on the processor reduces latency, as well as eliminating the need for a traditional Northbridge controller on the Intel P55 Express chipset. In fact, Intel P55 Express-based motherboards will not only combine the northbridge and southbridge controller into a single controller now called the Platform Controller Hub, they'll also remove the Front Side Bus altogether. This should remove a lot of bandwidth bottlenecks and improve overall processor-to-system connectivity. Several motherboards based on the Intel P55 Express chipset are already hitting retail shelves to coincide with the launch of the Core i5 700-series and Core i7 800-series of processors. However there's also a second-generation of Intel P55 Express motherboards that will include SATA 6 Gb/s connections waiting in the wings. Since the Core i5 700-series and Core i7 800-series of processors uses an 1156-pad socket with different sizings than Intel's existing socket 1366 or socket 775 processors, an entirely new heatsink and fan will be required for cooling. As always, Intel ships these processors with an appropriate stock cooler that should allow them to run at their default speeds without any issues. 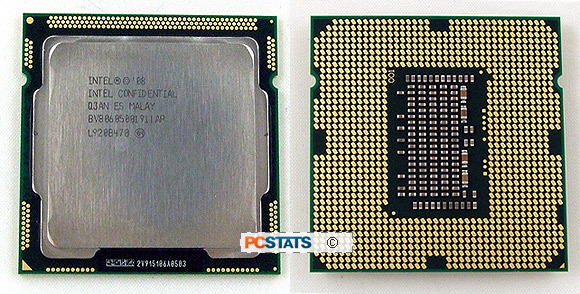 The Thermal Design Power (TDP) of the Core i5 700-series and Core i7 800-series of processors is a surprisingly low 95 Watts. This is in part due to the 45 nanometre manufacturing process that Intel uses, but is also part of an integrated power management controller that can disable the Core i5 750's individual cores under light CPU loads. Like the rest of the Core i5 700-series and Core i7 800-series, the Core i5 750 processor has 774 million transistors on a 296mm2 die, which is a higher transistor count and larger die than Intel's Core i7 900-series processors, thanks to the additional integrated PCI Express controller. Retailing for around $220 CDN ($200 USD, 125 £GBP), the Intel Core i5 750 processor costs about the same price as Intel's current mainstream Core 2 Duo E8500 processor, and significantly less expensive than high-end quad core parts, like AMD's Phenom II X4 965 Black edition and Intel's Core i7 920 processors. Will this new mainstream processor be able to hold its own against some of PCSTATS' most highly-rated processors? PCSTATS has the answers next....but first, what it takes to build an Intel Core i5 computer system. Pg 2. Building a Core i5 PC system? Pg 21. Core i5 - King of the mainstream?